Two-time failed presidential candidate Hillary Clinton is set to give a paid speech at Rutgers University on Thursday, but she will rake in significantly less money than what she received in 2014 to deliver speeches at UCLA and other campuses. Clinton, who recently received backlash for blaming her 2016 election defeat on voters who "don't want black people to have rights," among other factors, is expected to discuss politics, American democracy, and her role in shaping women's political history during the sold out event, according to NJ.com. 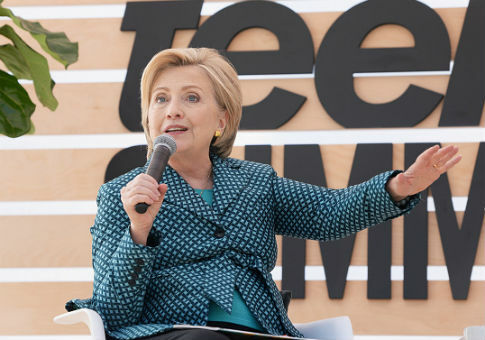 In one previously undisclosed transaction, the University of Connecticut—which just raised tuition by 6.5 percent—paid $251,250 from a donor fund for Clinton to speak on campus in April. Other examples include $300,000 to speak at the University of California at Los Angeles in March and $225,000 for a speech scheduled for October at the University of Nevada at Las Vegas. At UNLV, where officials have agreed to raise tuition by 17 percent over the next four years, student government leaders wrote a letter to Clinton last week asking her to return the planned $225,000 fee to the university. If she does not, they say, they intend to protest her visit. Thursday's event is hosted by the Rutgers Eagleton Institute of Politics and will be held at Rutgers Athletic Center in Piscataway, New Jersey. Clinton has made at least three public appearances in New Jersey since the 2016 presidential election. This entry was posted in Politics and tagged College Campuses, Hillary Clinton, New Jersey, Speech, University. Bookmark the permalink.